As my last few posts have described, I’ve been in wine country for the last few days and having a great time learning all about the different grapes and wine production styles. The first winery we went to was Merryvale Vineyards, which we loved. 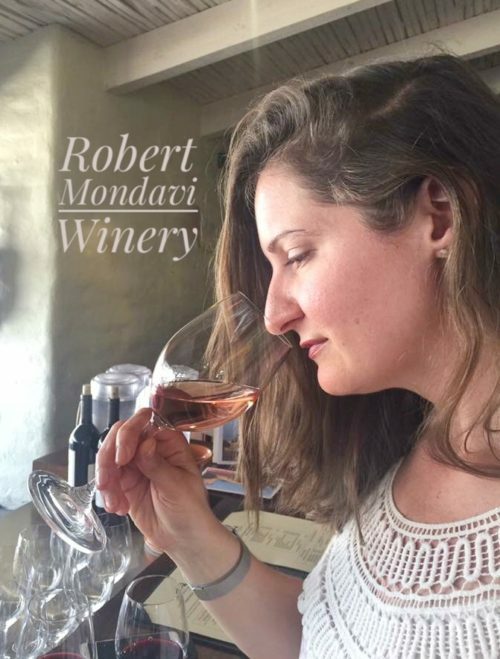 The second winery on our past was the Robert Mondavi Winery in Napa. The grounds were stunning, with bright, vibrant flowers lining the walkway, and lush vines wrapped around the front entrance. The grounds were open and welcoming, with a stage set up for their summer concert series. We headed to the general tasting area, where we were welcomed by the friendly bartending staff. They have two different wine tasting options, and we opted to actually combine the two so we could taste the rosé they offer. The first wine we tasted was the 2016 Spotlight Rosé. It was tart, crisp, refreshing, and light. A perfect summer drink! We could taste notes of honey, and the blend was with Malbec, Cabernet, and Petit Verdot. The second wine we had at Mondavi was the 2013 Carneros Chardonnay. I could smell loads of banana and pear, along with plenty of oak. It was tart and mouthwatering, with a light acidity and a lively flavor. The grapes for this wine are grown closer to San Francisco, bringing more acid to the wine since they are harvested earlier in the season. After the Chardonnay, we sampled the 2013 BDX Oakville. This deep red Cabernet Sauvignon has a black cherry flavor, with a dark, smoky finish. The dry, tannic flavors taste hot and you can almost feel a tobacco flavor hitting the back of your throat. An overall tasty and mouth-filling wine. Next up on the menu was another Cabernet Sauvignon, the 2012 Stags Leap. This one was also rich and full bodied with notes of cassis, blackberries, and walnuts. The Stags Leap was less tannic than the BDX Oakville, and had a smooth and full mouth feel. Our bartender Mike was very accommodating when he found out that I was trying to learn more about wines, and explained a lot about the winery itself as well as as the background of some of these wines. We felt welcomed in the winery, and I ended up buying a few bottles of the Spotlight Rosé to take home, as well as some of the unoaked Chardonnay. They were the only wines I bought in Napa, and I can’t wait to open them up at home! p.s. I was worried about shipping the wines, but they were impeccably packaged and safe and secure in their box. Thanks, Mondavi!